We are happy to modify or customize a variety of meals to reflect your needs. Please let us know of any food allergies, and a manager will work closely with you to identify a quality meal option for you. *The consumption of raw or undercooked meat, poultry, shellfish or eggs may increase your risk of foodborne illness. For decades, the Shanty Chalet was the social hub of the Sunapee region – a place where Tom Tuohy talked, and Judy Tuohy listened. Many regulars fondly describe it as the original “Cheers,” long before the television series – a place where everyone knew your name and a great conversation was a guarantee. Frank MacConnell, now owner of the neighboring Skinner’s Ski Shop, said when he’d return to the area from college, the Shanty was his first destination. With six children, Tom and Judy made the Shanty an extension of the Tuohy family home. A section of the restaurant was gated so Judy could watch over Tuohy toddlers while flipping steaks and burgers on the grill. The five brothers and I grew up sweeping floors, waiting tables, cooking and bartending. It was an education in people skills no school could teach. Now, two decades after the family business closed, brothers Joe and Josh Tuohy have bought and reopened the restaurant on the site of the old Shanty. The pair never left the hospitality business and founded Salt hill Pub in Lebanon in 2003, followed by Salt hill Pub in Newport in 2007 and another Salt hill Pub in Hanover in 2010. As this magazine went to print, Salt hill Pub at Mt. Sunapee was poised to open in mid-late December to much buzz about the return of the Tuohys. “I can’t wait for the next Shanty to happen,” MacConnell said. Lynne Tuohy is an award-winning journalist, incredible mom, and the best big sister you could ask for. She also pours a mean pint of Guinness. So many great beers, so little time… Please ask your server about our seasonal & guest draft offerings from the best breweries in New England and beyond. Don’t see your favorite pint here? Please ask your server for a full list of our wine and cocktail selections. 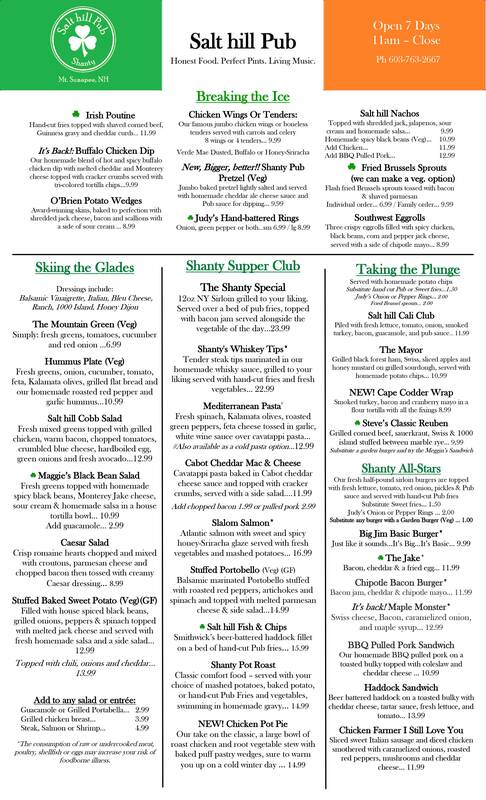 Check our daily specials every week Monday-Friday 3-6 P.M.
We’d love to host your next business luncheon, holiday gathering, birthday party, reunion, rehearsal dinner, or any other special event at Salt hill Pub. Our restaurants offer unique settings for most any occasion, and we are also happy to cater your event off-site. Please feel free to call, email or stop by Salt hill Pub to speak with us about menus, pricing and planning. We look forward to serving you! Honest Food. Perfect Pints. Living Music. Salt hill Pub is an ideal, smoke-free gathering place for friends and family, proudly owned and operated by brothers Joe and Josh Tuohy. 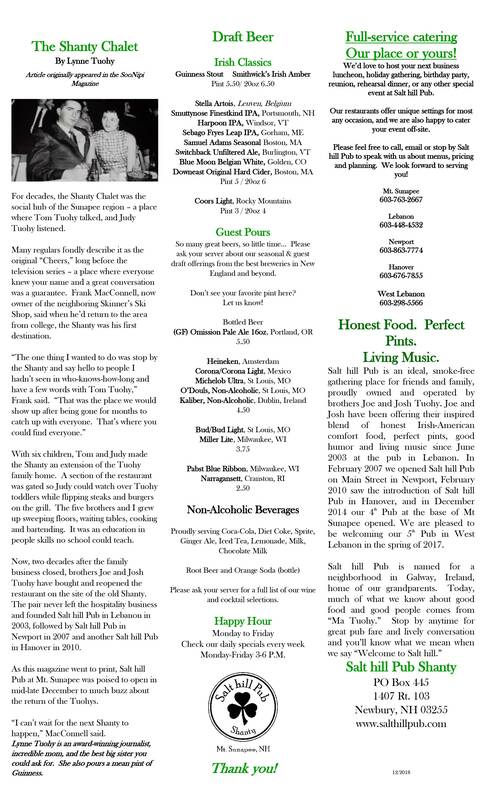 Joe and Josh have been offering their inspired blend of honest Irish-American comfort food, perfect pints, good humor and living music since June 2003 at the pub in Lebanon. In February 2007 we opened Salt hill Pub on Main Street in Newport, February 2010 saw the introduction of Salt hill Pub in Hanover, and in December 2014 our 4th Pub at the base of Mt Sunapee opened. We are pleased to be welcoming our 5th Pub in West Lebanon in the spring of 2017.